"Lord, you said that once I decided to follow you, you'd walk with me all the way. But I have noticed that during the most troublesome time in my life, there is only one set of footprints. I don't understand why when I needed you most you would leave me. The Lord replied, 'My son, my precious child, I love you and would never leave you. 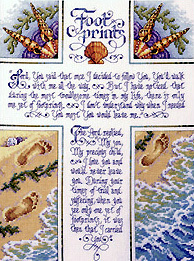 During your times of trial and suffering, when you see only one set of footprints, it was then that I carried you'"
Footprints is a beautiful sentiment and this lovely depiction of footprints in the sand is timeless. Stitch this beloved inspirational poem for someone special in your life. Quality motifs, beautiful colors, and subtle shading are hallmarks of this design. Contents: Finished size is 154 stitches high by 197 stitches high. If stitched in 14 count the finished size would be 11" wide by 14" high.